It may come as a surprise that the National Teacher of the Year never set out to be a teacher. 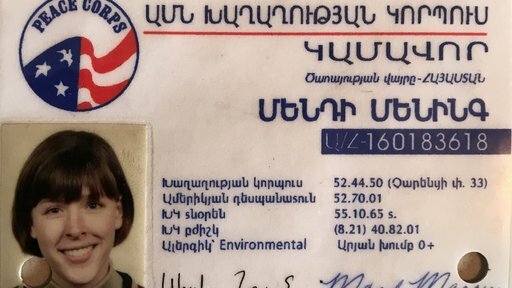 Mandy Manning served as a Peace Corps Volunteer in Armenia. In fact, I wanted to be a filmmaker. I had visions of impacting the world through cinema, but my experience in film school showed me the limitations of cinematic influence. I quickly learned my personality wasn’t well-suited to filmmaking. After a few months of floundering, I settled back into an idea I’d been kicking around since high school, I applied to the Peace Corps. As I went through the extensive application process and awaited my invitation to serve, I took a position as a paraeducator in a high school special education classroom. This proved helpful to my Peace Corps service, because after several long months, my invitation packet finally arrived. I’d been offered the opportunity to serve as a teaching Volunteer in Armenia. Little did I know this experience would change the trajectory of my life. I still had designs on filmmaking in the Peace Corps. I brought along a small camera and decided I would document my journey, determining that documentaries might be my genre. It was my teaching practicum during Volunteer training in Yeghegnadzor, though, that gave me pause. During those two weeks, I spent every evening preparing my lessons and props and every afternoon I spent working with my two classes, one 5th grade and one 8th. I loved my students and I loved figuring out what we would do every day. Most of all, I loved watching my students engaged in my lessons, excited to come to class, and using the language we learned together. Filmmaking completely left my mind. As a matter of fact, I have zero video documenting my Peace Corps journey. Over the next two years, not only did I work in my various classrooms — from elementary through adult — connecting with my students and figuring out how to teach them a language which had limited use in their immediate environment, I was also navigating a new world myself. I was a language learner, volunteering as a language teacher. Daily I encountered situations and experiences which challenged my perceptions, and forced me to adjust. Both extremely important skills to master as a teacher and skills I would take with me into my future classrooms. A couple of experiences stand out in my memory. 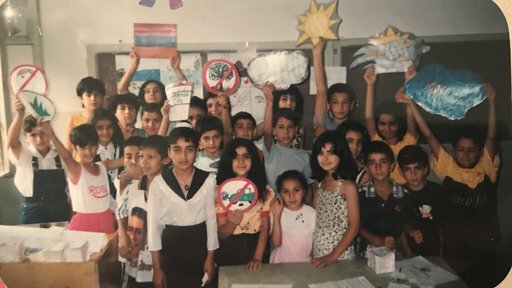 I taught in a small village school (Sayat-Nova Daprots) near Alaverdi, Armenia — close to the Georgia border. My school sat atop a bluff and I rode a jopan (gondola lift) to work each day. My English class occurred after regular lessons, so I had some interesting management issues. One day in particular, a large group of pigs came by my classroom and a group of boys, not in my class, tossed a bunch of firecrackers into the room. It was a wild day. We managed to stay focused, though, because I’d planned a singing activity and stopped just short of doing back flips to keep their attention on our lesson. My students always loved to learn songs. I had learned to roll with whatever came my way. In other words, I honed my skills in monitoring and adjusting. The second experience connected to one of my secondary projects. As a team, all of the Peace Corps Volunteers worked on a project called the hike for environmental awareness. A group of Volunteers hiked across Armenia to bring awareness to the nation about the importance of taking care of our environment. The rest of the Volunteers worked at each site to put together a mini-conference for kids about what it means to be environmentally aware. I was the site manager for Alaverdi. I learned so many organizational skills in that endeavor. I worked with local leaders to find a location for the event and then planned activities alongside my Armenian counterparts. When the day finally arrived, the hikers came in that morning and we all gathered at the venue. Kids from Alaverdi and the surrounding villages descended on us. The sheer number of young people was amazing. Our main focus was on litter. We sang and made posters and had a great day together. I learned so much through that process — about reaching across difference, about respecting social expectations in accomplishing tasks, and honoring culture. I also learned that all kids can get excited about topics like littering, with the right amount of planning and engagement. Such a wonderful experience, which I hope impacted my community, but I know impacted me. I also remember the little things — the small and large adjustments living in Armenia forced me to make. I also remember the sheer joy of living in a new and interesting community — walking down the street carrying my empty drum of kerosene to get it filled and being overcome with happiness, getting my first haircut and how much confusion ensued still resulting in a successful cut, being served baby pig's head with teeth still attached during New Year's because it was the most coveted cut of the pig, collecting water once a week, and shopping in the open-air market in which foods were only available in season. Navigating these every day activities, activities locals take for granted, gives me empathy and compassion for my current students, as they adjust to even the seemingly simple things about living in the United States. Peace Corps pushed me outside of my comfort zone, encouraged me to be open, and taught me communication and organizational skills which all hinged on interpersonal connections. When I returned to my home in the United States, I felt a bit lost. I still had only a degree in filmmaking, but I now had so many more skills and a world opened wide for me. My Peace Corps journey gave me a confidence I’d not had prior to serving, and opportunities to be and do whatever I chose. I still didn’t have a degree in education or teacher certification, but I did have two years of teaching experience through the Peace Corps. So, when I moved to Texas, I applied for a teaching job in the small rural town of Spearman. I got that job. Yes, because of my teaching experience, but more than that, because of the skills and experiences of being a Peace Corps Volunteer. Those two years in Armenia still impact me daily. Intentionally seeking an experience outside of anything I’d ever experienced before truly changed my worldview and helped me to see the beauty in difference and the value of meeting people different from myself. Because of this new perspective, I’ve been able to approach teaching with an open-mind and to accept different ways of being, thinking, and doing. Peace Corps has made me the teacher I am today, 17 years after my service. Without that experience I likely wouldn’t be here today as the National Teacher of the Year. Those of us who have the privilege to serve, know that it is our connections with one other, that human element, that impacts our communities most. Peace Corps service also ingrains in us the desire to have a positive influence on our future. For me, that meant teaching. What does that mean for you? 2018 National Teacher of the Year Mandy Manning worked in classrooms as a Peace Corps volunteer in Armenia after earning her bachelor’s degree in media and film from Eastern Washington University in Cheney, Wash. She now teaches English and math at Ferris High School’s Newcomer Center, which provides instruction for immigrant and refugee students.